Powers/Abilities: Brand had the ability to withstand flame. He could swallow flame or pass through it without receiving any damage. Brand could also hold his liquor. 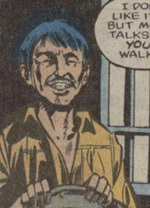 History: (Defenders I#135(fb)) - Little is known of the background of Peter Brand. At some point in his past, he discovered that he was immune to fire. He developed a reputation as an arsonist, and began to call himself "Blowtorch Brand," and even had a jacket made with that moniker on its back. ((New) Defenders I#139 (BTS)) - Moondragon's struggles to remove Odin's headband gave off low-level telepathy that drew Blowtorch Brand into the area. (Defenders I#135 (fb)) - Brand resented all the Mexican immigrants who were taking the jobs in his hometown of Elijah, New Mexico. 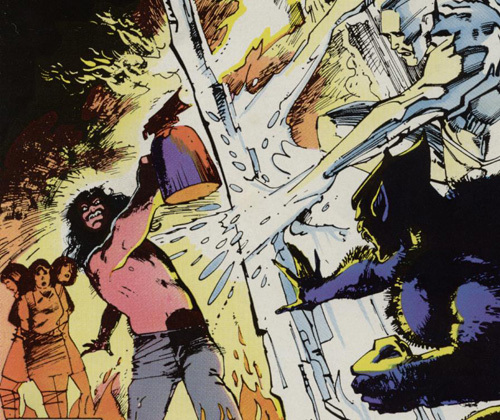 Brand also resented Warren Worthington (the Angel) allowing the Defenders to use the Worthington home above Elijah as the base for the New Defenders. 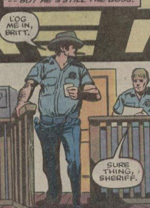 (Defenders I#135) - Blowtorch Brand was having a drink with his pal Bill down in Tex's Tavern. They discussed how the Mexican immigrants were over-running Elijah, their hometown. 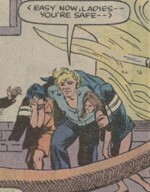 The conversation shifted to Warren Worthington's place up the road, and the mutants he was housing up there. Bill stated that Worthington (the Angel) could fly, and that he is "trainin' an army of muties" up there. Brand laughed and showed his own powers by lighting his glass of whiskey on fire, drinking the whiskey, and then belching the flame. He bragged that it didn't even hurt him as he passed his hand through the flame. The Defenders came into Elijah seeking to put Manslaughter (an enemy they had just beaten in battle) in jail. 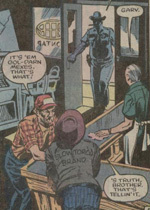 As Sheriff Garvin Macken discussed this with the Defenders, Tex came running down the road yelling that Brand was going to burn his tavern down. Moondragon investigated, and saw Brand in the tavern with his clothes aflame and laughing that the fire couldn't touch him. When Moondragon didn't consider Brand worth the effort of battle, he launched his burning whiskey bottle at her, setting her cape on fire (while ridiculing her baldness). Cloud, furious at this, put the flame out, then (after Brand sexually harassed her) forced all the oxygen out of Brand's lungs. Brand collapsed, and Sheriff Macken took him away. Two days later, Brand was bailed out by Raul, a Mexican immigrant. Brand met Raul's employer outside of the jail. The unnamed employer offered Brand $5000 to burn down his bootleg designer jeans factory so that the feds couldn't shut him down for employing illegal aliens. Another two days later, Brand made his move. He set the building aflame and blocked all the entrances, keeping 20 Mexican workers inside with him. Brand fired his gun at the cops to keep them away, and shot one woman in the back when she tried to escape. Soon, the Defenders broke through the wall. Iceman blocked one gunshot from Brand and the Beast narrowly dodged another. Brand blasted Cloud as well before getting taken down at sword point by the Valkyrie. 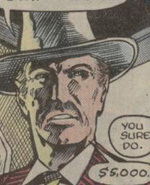 The Defenders rescued the workers from the burning building, but Sheriff Macken died from smoke inhalation incurred while rescuing two more women, Rosita and Estrella. The Valkyrie escorted Macken's soul to its final resting place. (USAgent I#2) - Years later, Brand was attending a movie alone. Another theater patron, secretly a Scourge agent in disguise, shot and killed Brand. Blowtorch Brand was the final victim of the Scourge of the Underworld organization before it was shut down. Comments: Created by Peter Gillis, Don Perlin, and Kim Demulder. 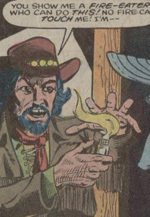 Blowtorch Brand was one of a number of one-shot villains from the New Defenders days. He's likely only remembered in Marvel history as yet another victim of the Scourge. Thanks to Brandon Nash for pointing out Brand's mutant status from his profile in Defenders: Strange Heroes (2012). Garvin Macken served as the sheriff in Elijah, New Mexico, with his deputy, Britt. Little is known about his past until he came into contact with the New Defenders and Blowtorch Brand. Sheriff Macken met his death while rescuing two Spanish women from a fire Brand started. Valkyrie escorted his soul to its final resting place. Rosita and Estrella were two of the twenty women trapped in the textiles factory fire by Blowtorch Brand. Both women were illegal aliens. They were rescued by Sheriff Macken, who gave his life to save them. The unnamed textiles factory owner hired several illegal aliens to work in his plant. When he feared he'd be prosecuted for the hires, he hired Blowtorch Brand to burn down his factory, killing all the workers in the process. Raul was an employee of the factory owner, and was sent by him to bail Brand out of fail. Nothing is known about the background of Tex or Bill. Tex owned Tex's tavern in Elijah. He ran for Sheriff Macken's help when Brand started burning the tavern. Bill was a drinking buddy of Brand's and had racist attitudes toward the illegal aliens and toward mutants.